Sarah Carpenter lives in an isolated farmhouse in North Yorkshire, and for the first time after the death of her husband some years ago and her children, Louis and Kitty, leaving for university, she's living alone. But she doesn't consider herself lonely. She has two dogs, a wide network of friends and the support of her best friend, Sophie. When an old acquaintance, Aiden Beck, needs somewhere to stay for a while, Sarah's cottage seems ideal, and renewing her relationship with Aiden gives her a reason to smile again. It's supposed to be temporary, but not everyone is comfortable with the arrangement: her children are wary of his motives, and Will Brewer, an old friend of her son's, seems to have taken it upon himself to check up on Sarah at every opportunity. When Sophie disappears, it's clear she hasn't been entirely honest with anyone. And as the weather closes in, events take a dramatic turn when Kitty, too, goes missing. Suddenly Sarah finds herself in terrible danger, unsure of who she can still trust. But she isn't facing this alone; she has Aiden, and Aiden offers the protection that Sarah needs. Doesn't he? 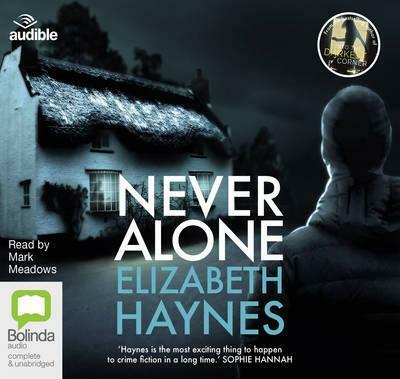 Elizabeth Haynes is a police intelligence analyst. She started writing fiction in 2006 thanks to the annual challenge of National Novel Writing Month (Nanowrimo) and the encouragement of the creative writing courses at West Dean College. She lives in a village near Maidstone, Kent, with her husband and son. Her first novel, 'Into the Darkest Corner', was the winner of Amazon's Rising Stars and has been translated into 30 languages. Her second novel, 'Revenge of the Tide,' was published in March 2012. Mark Meadows is a British actor with extensive theatre, film and TV credits, and is a frequent contributor to plays, musicals, narrations and readings for BBC Radio 3 and Radio 4. He has narrated around 80 audiobook titles and was a nominee for the 2013 Audible Narrator of the Year award. Mark also provided the voice of the ship's computer in Ridley Scott's Prometheus. Audible is a seller and producer of spoken audio entertainment, information, and educational programming on the Internet.